According to Tarot mythology, the original purpose of Tarot was as a game, not as a divinatory tool. It appears that divination with playing cards started to become popular in the late 16th and the early 17th century. Although, at that time, it was far more simple than the way we use Tarot today. By the 18th century, however, people were beginning to assign specific meanings to each card and even offer suggestions as to how they could be laid out for divinatory purposes. British occultist Arthur Waite got together with artist Pamela Colman Smith and created the Rider-Waite Tarot deck, which was first published in 1909. At Waite's suggestion, Smith was the first artist to use characters as representative images in the lower cards. Instead of showing merely a cluster of cups, coins, wands or swords, Smith incorporated human figures into the artwork, and the result is the iconic deck that every reader knows today. At present, many people refer to this deck as the Waite-Smith deck, in acknowledgment of Smith’s enduring artwork. Now, over a 100 years since the release of the Rider-Waite deck, Tarot cards are available in a practically endless selection of designs. In general, many of these follow the format and the style of Rider-Waite, although each adapts the cards to suit their own motif. The Tarot is probably one of the most popularly used tools of divination in the world today. While not as simple as some other methods like coffee cup, pendulums, tea leaves, etc. the Tarot has drawn people into its magic for centuries. Today, cards are available for purchase in hundreds of different designs. There is a Tarot deck for just about any practitioner, no matter where his or her interests may lie, it could be of angels, past lives, messages from deceased ones, pets… you name it, there’s probably a deck out there for you to choose. Although methods of reading the Tarot have changed over the years, and many readers adopt their own unique style to the traditional meanings of a layout, in general, the cards themselves haven’t changed much. However, certain myths about tarot cards are busted. God speaks to us through our dreams, hunches, instincts, and inner voices, opening closed doors. Like dreams, prayer is a powerful tool to realize God. Whatever we feed our subconscious mind - false or true, good or evil - is registered as fact. When your thoughts accumulate, they become your beliefs and beliefs haunt your mind. The mind is a vast ocean of potential. You can dive into it, surf it, float it, swim in it, play it, and have fun in it. A devotee asked Ramakrishna Paramhansa "Sir, is God real and can I see him?" Ramakrishna replied, "yes, God is real. I see him just as you or any other object around me." The devotee continued, "Can I also see Him as you do?" Said the sage, "yes you can, if the intensity of your longing for God is equal to the intensity of a drowning man longing for fresh air; or the intensity of a mother longing for the life of her only child in the grip of serious illness... if your longing for God is at least a fraction of the longing which Radha had for Krishna, then you will see God." You can interpret Tarot cards as the message of God; a true voice of God. You can hear this voice if you have the intensity to read into the images of the cards. The final judge, therefore, is you, who can interpret the meaning of the cards. According to Tarot mythology, Tarot readings are a combination of intuition, skill, and knowledge. Obviously, you can ask the tarot what you like, although it is, in fact, a vehicle for exposing what you already know. Any card drawn in response to an issue is a direct reflection of what you are sometimes unable or unwilling to recognize at this time. And yet, it is only through recognition (without judging as right or wrong) from a detached perspective that you can begin to fully experience your height and depth — all the colors of our rainbow being. It would also help you to know what are good questions to ask during a tarot reading. Remember to stay in the present as you turn the cards over, allowing your inner responses to clarify your outer issues. As you will experience, the images of the Tarot are alive. Their impact is undeniable, for they speak to us in a language that our deeper selves recognize. They awaken understanding. They provoke clarity. TIP: Be as silent and focused as possible when you are choosing tarot deck and using it. Tarot mythology says that the more you are able to perceive the process as a gift for your individual growth, the more meaningful the messages will be for you. How we perceive things relies heavily on our subconscious. There are those who believe that, with Tarot, the subconscious projects its own interpretations on the Tarot cards. As a person receiving a Tarot reading, your interpretation of the cards is a result of the factors in your life that shape who you are and what you are about. The questions you have about your life (usually the reason for consulting the Tarot in the first place) are projected onto the pictures; so you define answers from what you see. This is how tarot works. It is useful in helping us tap into our subconscious to find answers that we might never consciously think of. Whether you’re a Tarot beginner or a seasoned expert, choosing Tarot deck can be incredibly overwhelming. There are literally hundreds of different Tarot decks to choose from, all with their own symbolism, energy, stories, Tarot mythology, and artwork. So, where do you begin? How do you find your perfect Tarot deck? The most important way to choose a Tarot deck is to find one that you personally and intuitively connect with. Take a good look at the Tarot cards within a specific deck. Go through them one by one or, if you’re viewing them online, find as many images as possible via Google or even Instagram. Observe your first reaction to the images. Do the patterns appeal to you? Are you drawn to the images and the artwork? Are there other variations of the deck that are more appealing? Also, can you look at the cards and start to get a sense for the meaning of each one? Look at both the Major and the Minor Arcana cards. It’s important to view as many of the cards in the deck as possible as some Tarot decks have a handful of gorgeous cards, but the rest of the deck is not so visually appealing. If you are new to Tarot, you may prefer to start learning with the most popular Tarot deck, the Rider Waite deck. As the Tarot mythology goes, it’s easy to understand. The imagery is straightforward and practical and there is a huge amount of information available for this deck. Most Tarot decks will come with a book explaining the artwork and the Tarot card meanings. However, some decks have more information than others. And some may have no information at all! To know what the tarot cards are speaking for you in the coming, the August 2018 horoscope is here. If you prefer knowing exactly what a card means and why, then make sure you check out the Little Book that comes with the deck to see if it gives you what you need. Or, if the accompanying book isn’t enough, look online to see if there is a blog or an eBook that explains the cards in more detail. Think about what kinds of Tarot readings you want to do and how you want to connect with your Tarot cards. The beautiful thing is that there are so many Tarot decks from so many different backgrounds. 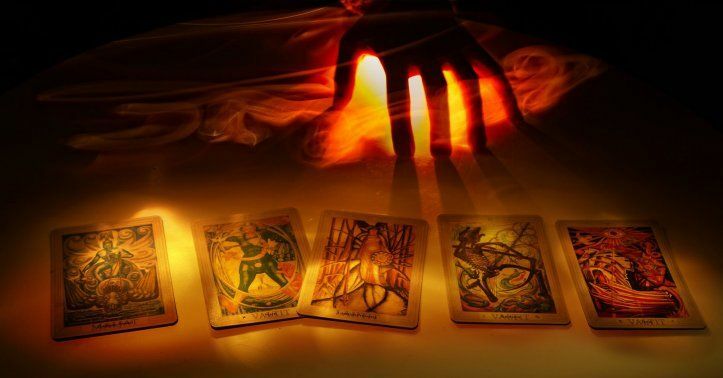 And if you are a professional Tarot reader, consider having a number of different Tarot decks on hand, depending on what is best suited energetically for your client and situation. Find a deck that’s perfect for your personal needs and desires. Tarot is available for anyone. Explore yourself and others through cards. Light and shine.